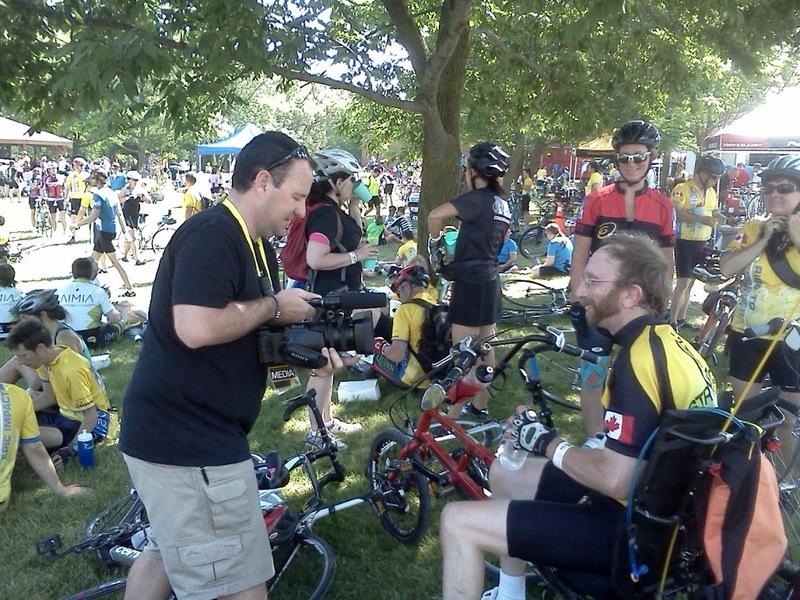 My brother Alex being Interviewed during the Ride to Conquer Cancer 2012. Freezing rain and ice pellets aside, it must be spring, because there were earthworms all over the bike lanes this week. Thank God for fenders. Yes, I have finally gotten started on my 2013 cycling season. It’s pretty damp in the morning which makes it seem a lot colder than it actually is, but even so, it feels good to be on the road again. There’s just something about riding a bike that makes me feel so much younger than I feel most mornings. I turn 60 next year and a lot of mornings I feel every bit of my 59 years and then some. But this past week, riding to Guelph Little Theatre last Saturday, then to work a couple of mornings, I have felt better than I have in a long time. Winter’s over (weather be-damned), spring is here; I’m on my bike again. Life is good. Of course that also means that the Ride to Conquer Cancer, benefiting the Campbell Family Research Centre at the Princess Margaret Hospital in Toronto, is less than two months away (it’s happening June 8th & 9th). The next few weeks will be very busy as Team Kortright ramps up its fundraising efforts. Stay tuned for more info on these efforts in the days to come. This week however, I am very pleased to announce that we have two new team members this year; Dr. Phil McAlister and Les Ferrier. Many of you in the Guelph area will be familiar with Dr. Phil from his Living Healthy show (available o n YouTube) and his work at Tranquil Therapeutic Solutions on Scottsdale Drive. He’s been a cyclist both on and off road for some time and it’s great to have him on board. have him on the team as well. Welcome to both Les and Phil. On the downside however, this year even more of my friends are battling with this terrible disease. edges to raise before they enter the Ride. With nearly 5000 riders again this year I’m sure we’ll set a new record once again. Or maybe you haven’t sponsored me before. In that case I invite you to do so for the first time. Your donation will go to continue the research and patient support at the Princess Margaret. Last year the nearly 5000 riders rose over $16 million, the largest cycling fundraiser in Canadian history. It was a remarkable experience. So please; follow the link to my personal Ride page and make a donation. You can donate online or print out a donation form to send in with your cheque. If you get there and it happens that my $2500 goal has been reached then I would ask you to support me by sponsoring one of the other members of Team Kortright. You can sponsor me with a donation at the following link or by clicking the banner in the left margin.